"Seaweed fights obesity, reasearchers in Newcastle claim" by BBC. The article is about scientists testing to see if seaweed, as an ingredient in your diet, could help you lose weight. "Seaweed bread 'key to obesity'" from The Guardian. This article is about Dr. Ian Brownlees attempts to discover if seaweed in various food products can help the human body not absorb the fat in the food. Also known as Irish Moss, this dense, reddish purple seaweed grows in the temperate North Atlantic coastal waters around the West of Ireland, France and off North America's coastline. It is harvested and sun-dried which bleaches it to a yellowish brown colour. Rich in iodine and vitamin A, it produces a softer gel than agar agar. Carrageen requires thorough rinsing before use. It needs to be soaked and then well cooked with the liquid to be set and does not dissolve completely. Carrageen Mould is a traditional Irish pudding made by soaking 1/2 z/10-15 gm carrageen in water, draining and adding it to 1 pint/600 ml of milk, bringing it slowly to the boil and simmering it for 20-30 minutes, straining it and allowing the strained mixture, which can be sweetened, to set on cooling. Carrageenan (E407) is a by-product of carrageen and is used extensively as an emulsifying, thickening and gelling additive in ice creams, jellies, biscuits, milk shakes and frozen desserts, even in some cosmetics and medicines! "Tang gør dig rask" from BT. In this article the application of seaweed in your daily diet are discussed. It also states how seaweed can help you get the vitamins and minerals needed everyday. You can see a scan of the full article here. "Tang og fiskeskind bliver til mad" from the Danish local newspaper Nordjyske. 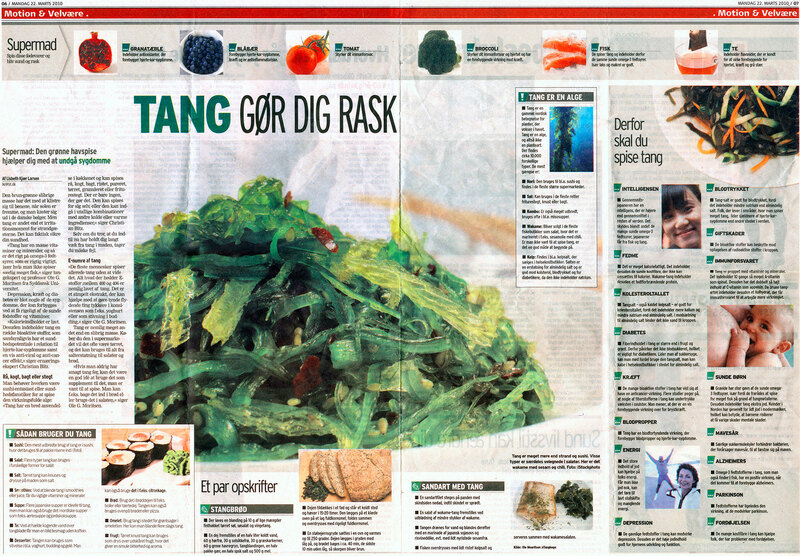 This article from the Danish local newspaper Nordjyske tells about the nutritional benefits of a daily consumption of seaweed and it tells about Nordic Seaweed as a business. "Tang. Grøntsager fra havet" by Ole G. Mouritsen. Ole G. Mouritsen is dr. scient. and a professor in biophysics and has written the book "Tang. Grøntsager fra havet". The book is about the science, cultural history, nutrition and health regarding seaweed as a food product. "Tang er fremtidens grøntsag" from Fri.dk. The article is about the history of seaweed in regards to cooking and how seaweed is used by the cook Jacob Mielcke from the restaraunt Mielcke & Hurtigkarl in Copenhagen. "Tang er fremtidens superfood" from Alt om København - AOK. The article from AOK.dk is about Ole G. Mouritsens book "Tang. Grøntsager fra havet". You can find the book on the authors website.